AZADIAN LAW GROUP, PC REGULARLY REPRESENTS CLIENTS THROUGHOUT LOS ANGELES WHO ARE THE VICTIMS OF AGE DISCRIMINATION IN THE WORKPLACE. The Los Angeles Age Discrimination Lawyers at Azadian Law Group, PC understand how age discrimination impacts the life of older employees and the employees’ families. When older employees are terminated they also face much more difficulty than younger employees in finding a new job, which can cause severe financial damages and also emotional distress to employees. The age discrimination lawyers at Azadian Law Group, PC fight employers aggressively to make sure they secure the maximum recovery for victims of age discrimination. Often referred to as “out with the old and in with the new,” age discrimination involves treating an applicant or employee less favorably because of his/her age. Both Federal and California law forbids age discrimination against people who are age 40 or older. The law forbids age discrimination when it comes to any aspect of employment, including hiring, firing, pay, job assignments, promotions, layoff, training, fringe benefits, and any other term or condition of employment. These laws include the Federal Age Discrimination in Employment Act (ADEA) and California’s Fair Employment and Housing Act (FEHA), along with regulations issued by the Federal Equal Employment Opportunity Commission (EEOC) and California’s Department of Fair Employment and Housing (DFEH). Asking older employees when they plan to retire or pressuring them to retire may also be age discrimination. See France v. Johnson, 2015 U.S. App. LEXIS 17915 (9th Cir. Oct. 14, 2015) (summary judgment improper because the supervisor’s “retirement discussions with [employee] . . .[are] circumstantial evidence showing [supervisor’s] bias in his decision-making process”).) However, a few jobs do have valid mandatory-retirement ages (such as air-traffic controller and pilots). Even an employment policy or practice that applies to everyone, regardless of age, can be illegal if it has a negative impact on applicants or employees age 40 or older and is not based on a reasonable factor other than age. Employees who complain about age discrimination cannot be retaliated against due to their complaints. These complaints often are made by employees to their supervisors or to human resources and include complaints relating to favoring younger employees or asking older employees to retire. 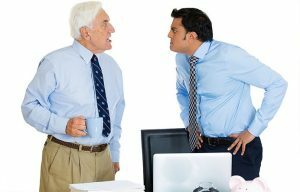 In a retaliation claim, it is irrelevant whether age discrimination actually occurred – all that matters is whether employee reasonably believed he or she was the victim of discrimination and complained about it. See Flait v. North American Watch Corp., 3 Cal. App. 4th 467, 477 (1992) (“An employer may not “fire an employee because he opposed discrimination against a fellow employee, even if he was mistaken and there was no discrimination.”). It is also unlawful to harass a person because of his or her age. Harassment can include, for example, offensive remarks about a person’s age. Although the law doesn’t prohibit simple teasing, offhand comments, or isolated incidents that aren’t very serious, harassment is illegal when it is so frequent or severe that it creates a hostile or offensive work environment or when it results in an adverse employment decision (such as the victim being fired or demoted). The harasser can be the victim’s supervisor, a supervisor in another area, a co-worker, or someone who is not an employee of the employer, such as a client or customer.